It is unusual for us to feature a spindle turner in Woodturning magazine, but Peter Galbert is a chair maker who, in my opinion, is very worthy of being profiled. Peter is a full-time chair maker who lives and works in New York. I started out by asking Peter a little about his background. He tells me how he grew up in Atlanta, Georgia but eventually moved north to attend art school in Chicago. "I started my education in painting and sculpture and used woodworking to help make my way through school," he says. Besides a short time assisting a cabinet maker and a couple of one-week courses, Peter is self-taught. "I built furniture and sculpture in Chicago and New York. In the late '90s, while maintaining a small shop in New York city, I began my investigation into green wood chair making." Once Peter had made one chair, he was hooked. Soon after making this realisation, he left the city to live in the country and began to live a life focused on chairs. Peter tells me how he discovered woodturning as a result of chair making. 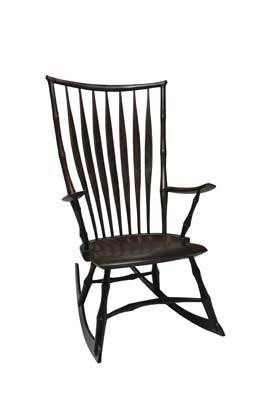 He comments on how he had never turned anything before making chairs, and the lathe was the logical - not to mention traditional - tool for making the legs and joinery of the chairs that he was interested in. Peter therefore began to experiment with a lot of spindle turning for the legs and chair components. Unlike many other turners I have profiled, Peter's style is somewhat more limited, in that he works with spindles and spindles alone. He does not turn hollow forms, bowls, or sculptures. So I was interested to see how his spindle turning has developed and evolved. 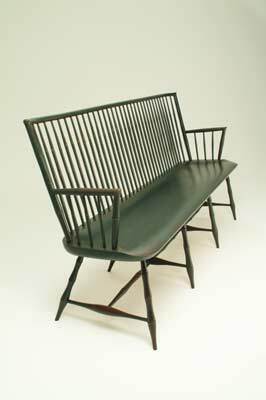 He tells me that early on in his turning career, he focused on the traditional baluster shape that is associated with Windsor chairs, but how later, he moved into the more simplified lines of the bamboo styles. "Nowadays, much of my turnings are even simpler shapes that can be spokeshaved to finish the surface. During this period, while the shaping of the pieces have become more sparse, my use of the lathe for joinery has become more complex," he tells me. Peter now uses offset turning to shape joints on parts that are later bandsawn and hand shaped to finish, as well as creating turnings that are steam bent into shape. "Steam bending turnings adds strength to the chairs and the ability to turn details into my bends adds visual interest," he comments. Peter tries to make chairs that have a cohesive logic and sense of rhythm to the parts, and the ability to use the lathe for many of these parts builds the relationships that help the different elements add up to the whole. Peter loves the meditative quality of turning. "Sharp tools slicing through wood are always a pleasure and the challenge of making each turning better keeps me focused and interested," he says. Peter comments that his turning style is "rather pedantic," in that he uses relatively standard techniques to make the shapes, but he tells me how he strives to create a harmony from one detail to the next that gives the whole a sense of rhythm. "A series of textbook perfect details in a row does not necessarily add up to a beautiful leg. The subtle variations within a single turning and between the turnings in a single chair lends a human quality that I strive for," he finishes. So how long does it take Peter to complete one of his chairs? To my surprise, he says that the actual making of a chair can take anywhere from one to two weeks, but, unsurprisingly, the development of the design is an ongoing process and often takes months. So, what or who is Peter inspired by? I was intrigued to learn whether other turners inspired Peter, or whether he leaned more towards furniture makers, or perhaps other sources? He tells me that what inspires him most is the challenge and history of chair making. "There is such a long series of ideas and materials that have been engaged to address the problems of chairs. 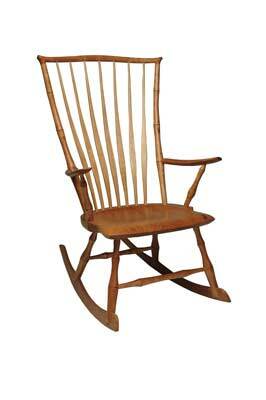 To be successful, a chair must be comfortable, durable, beautiful from all angles and at its best, a joy to make." Even with all of the solutions presented by the past, Peter comments on how he is still challenged to attempt another approach. The other inspiration is provided by the tools and materials that Peter uses. In working with green wood and hand tools, he can achieve results that would confound machinery. "The ability to shave along the fibres of the wood with a drawknife forms the foundation for the structures that I build. I can achieve similar results by splitting wood from a log and turning it and bending it," he tells me. Peter goes on to explain how these techniques keep his workshop quiet and dustless and affords him the ability to make his chairs with more space than wood. close to the tree and limit my tooling has opened worlds of design and technology," he finishes. In terms of how his work has changed since he first started turning, Peter says that his sense of comfort with the tools has enabled him to completely abandon the need to sand and also to focus on relationships and proportions of his turnings. In this sense, he can now work smarter and faster than he once did, and ultimately this makes him more efficient and productive. Peter describes his turning style originally as reproducing that of an obvious historical style. "I like to think that my current work, while still strongly grounded in precedent, is adding to form. When a piece is successful, it should defy definition or time period." I also wanted to find out about Peter's workshop, and how this differed to a typical woodturner's arrangement. For example, what is different about a spindle turner or chair maker's workspace? Peter's workshop is a timber frame structure that was community built and raised about five years ago. "It is small - 16ft by 30ft - and has lots of southern facing windows that overlook my pond and house." 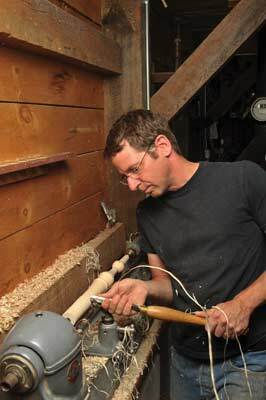 He uses few power tools, just a lathe - which Peter considers to be a hand tool - a bandsaw and a power drill. "Besides that my shop has a few shavehorses, a workbench and a large sharpening area." I also wanted to know if there were any special tools or jigs in the workshop that Peter could not do without. "I do my best to make sure that every tool in my shop is earning its rent, but the log splitting tools, the lathe, shavehorse and drawknife are where all of my work begins, and often ends," says Peter. I asked Peter about his work ethos and how he applies this to his everyday tasks in the workshop. He tells me that his ultimate goal, as far as his work is concerned, is to work with the materials, tools and labour that are within a simple logic of what the wood does best. "By working within these limits, I have resources that are always within reach. While this may sound limiting, I've found that it keeps me from engaging with tools, materials and techniques that I don't enjoy. While elaborate jigs and tooling can bully the wood into all sorts of shapes, it too easily ignores what the wood does best." Peter often reminds himself to avoid this by thinking of someone mistaking a loaf of bread for a doorstop. "Not only is it a lousy doorstop, but you'd be missing the whole point of it to use it this way." I think that this is a great analogy. So, what does Peter consider to be the high and low points of his career? He tells me how the low point probably came while floundering in New York. "I was trying to make ends meet and was seeing no way to make a living at woodworking but to get a big shop, spend a bunch on loud, dangerous machines and take whatever work I could get." Peter explains how he was on the brink of giving up when he decided to go the other way and get simple with the tools, materials and product. 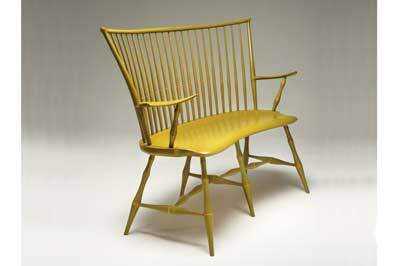 "In a way, chair making was my last chance," he says. Conversely, he sees the greatest successes build daily as he walks to his workshop and counts another day that he gets to work for himself and follow his interests. "I am sincere in my constant appreciation of this. When I get into the shop, if my goal is refining a skill, or developing a design or a tool, I do it. For years I feared that I was indulging in distractions, but in hindsight, it's worked to my benefit. I have been thrilled to work alongside some of those whose work inspires me and to get to write and share my interest and experience with others," says Peter. I had come across Peter's website, but I was interested to learn about what other methods of promotion he uses. He tells me that besides the occasional gallery show, he has a small showroom in a town nearby and writes for magazines as well as keeping his own blog. "Teaching across the country has also helped build my business. I also produce a turning tool called the Galbert Caliper (tested in Woodturning issue 218). All of these things have worked together to keep me constantly busy," he tells me. So where does Peter see his career heading? Does he plan to continue on the same path, or does he want to focus on and develop his tool making? He tells me how he hopes to continually, and perhaps selfishly, limit his working life to those things that he finds fun and inspiring. "With this as my first goal, I know that I have, at the very least, a job that will be satisfying, then I just have to make it pay." Peter also tells me how he is currently working on a book and videos as well as expanding his small farm to include chickens, goats, maple syrup and bees. "Fulfilling each of these activities so that they are successful, while balancing my time, is the challenge that I hope to master. I hope to keep making new designs and eventually settle into a production and teaching rhythm that gives enough energy to keep both fresh." It was a pleasure to work with Peter in compiling this profile. 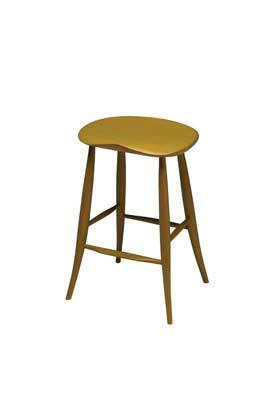 The chairs, stools and larger pieces he produces are truly stunning and hark back to traditional methods of craftsmanship. Take a look at his website for further examples of his work, more information about him, and you can also read his blog to keep up with all the latest happenings in the life of a full-time chair maker.